Make history with the all-new 2018 Dodge Durango SRT. It’s the most powerful production three-row SUV to ever exist, boasting more than 400 horsepower and the ability to elapse a quarter mile in under 13 seconds. Not only do you have insane track capabilities with the 2018 Dodge Durango SRT, but you can also count on a best-in-class towing rating of 8,600 pounds-a figure more than some trucks. A single glance at the Durango SRT and you can see that it’s full of power, covered in design cues such as an SRT hood complete with an air inlet duct with heat extractors, a menacing new front fascia, and a bold lower valence that houses the Durango SRT’s LED foglamps and cold-air duct. 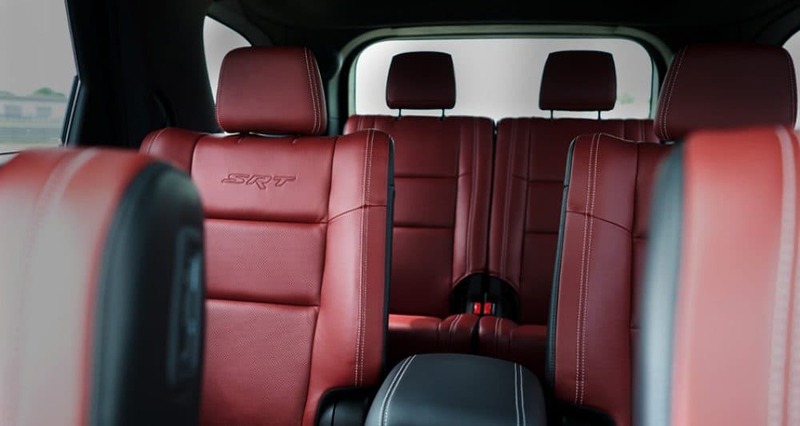 Leather and suede are standard in the cabin, giving the Durango SRT a feel of true luxury with the impressive high-quality, soft-touch materials scattered throughout the SUV. 2018 marks the first time ever that SRT power is available within the Dodge Durango. It’s not surprising considering the strong, bold aesthetic and impressive powertrains that have existed within the main lineup for years. The engine found within the Durango SRT is a 392-cubic-inch powerhouse-a 6.4-liter HEMI V8 engine that churns out 475 horsepower and 470 pound-feet of torque. This much power truly makes the Dodge Durango SRT move-accelerating from zero to sixty in a mere 4.4 seconds and running the course of a quarter mile in just 12.9 seconds. The Durango SRT also features a seven-mode drive system, manually adjustable by the driver; these seven modes include Auto, Sport, Track, Snow, Tow, Valet, and ECO. The Durango SRT can also come to a stop in a breath-taking 115 feet due to its massive Brembo high-performance six-piston front calipers, four-piston rear calipers, and 15-inch vented rotors. The promise of the Durango SRT is the same as always: uncompromised utility, advanced technology, and defiant, aggressive styling. Refreshed styling is present within the cabin of the 2018 Dodge Durango SRT. Lively silver accent stitching trims the hand-wrapped dashboard. A flat-bottom SRT steering wheel designed with performance in mind features standard integrated paddle shifters. Heated seats can be found in both front and second-row seats, alongside ventilation in the front seats. The front seats feature Nappa leather and suede inserts with silver-stitched SRT logos. Embossed SRT logo flourishes can be found on the second-row seats as well, giving them an exclusive look. For the real deviant, Demonic Red Laguna leather is available, creating an even more menacing appearance. An all-new 7-inch, thin-film transistor digital instrument panel is standard and allows for the driver to choose the information that they see. Also standard is the class-exclusive and sought after Uconnect 8.4-inch touchscreen and infotainment system, boasting Apple CarPlay/Android Auto smartphone integration, navigation, HD radio, and more. What’s the towing capacity of the 2018 Dodge Durango SRT? The towing capacity of the 2018 Dodge Durango SRT is 8,600 pounds! Are LED headlights, taillights, and foglights standard for the 2018 Dodge Durango SRT? Where can I view current new vehicle incentives? You can view current new vehicle incentives here! With more than 60 standard and available safety and security features, the 2018 Dodge Durango SRT provides everything a driver could want. If you seek incredible amounts of power, a capable three-row SUV, and a luxury driving experience, look no farther than the 2018 Dodge Durango SRT. 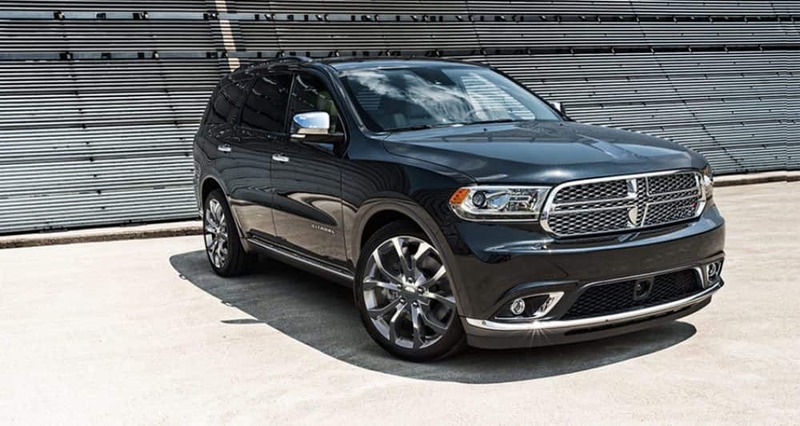 To learn more about the Dodge Durango SRT, contact us today!